The Biblical World: Don't like Halloween? 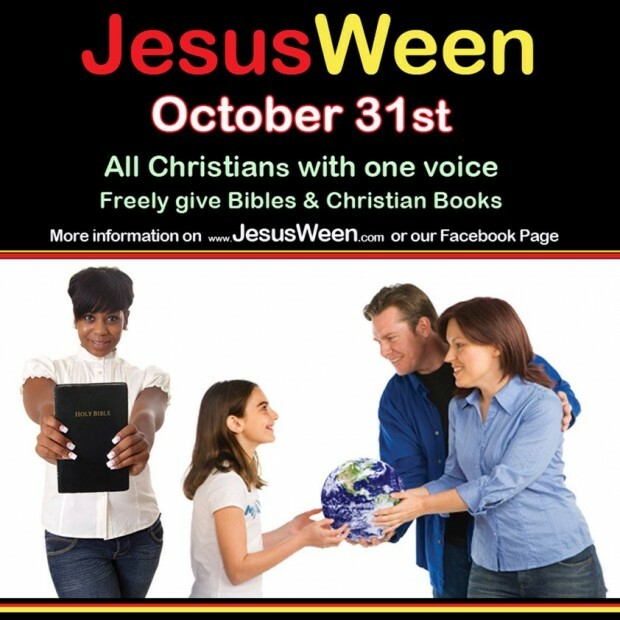 What about Jesus Ween? I tend to agree with your stance on halloween (best to ignore), but I also understand that this is a way children can be.. distracted, if you will, from the desire to participate in halloween functions. Too bad the video seems more like it's out for profits than sharing the Word. There are so many mixed messages here, besides the 'help the Christian bookstores profit' one. 'Giving away Bibles in a friendly way' is one more example of evangelism done incompletely. The Good Book, disembodied from a caring heart and a loving spirit, faces an uphill battle in changing a person's perspective on Christianity and God, especially if one lands in a lovely OT passage where God is really ticked off. Cider, doughnuts and a rousing evening of fun and games. Enjoy the season, revel in the sights, sounds and smells of autumn and be still. Isn't this how Christians started the celebration of Christmas in December--as a response to the pagan celebration of the winter solstice? Julius Caesar established this winter solstice celebratory date as December 25th in 46 BCE. The date to celebrate Christmas was established in 386 CE. Was Jesus really born at this time of the year? Probably not. However, how does the church take the eyes of Christians away from the fun and festivities of the pagans--by having a holiday just for them! Perhaps Christians are just undercover party animals. Who knows, "Jesusween" just might make the list of bigtime Christian holidays, and the Palm Sunday-Easter-Christmas church goers may just become Palm Sunday-Easter-Jesusween-Christmas-ers. I do think they need to change the name though. "Jesusween" . . . really?!? The 31st Oct. is a special day for protestants. In our church in Goerlitz (eastern Germany) we have a church night, a festifal for kids and youth. It is an alternative for Halloween (which also in germany is more and more popular), but we do have reason to celebrate: the rediscovery of the Gospel of free grace. we celebrated it for ths 6th time and it is something which is seen by others in our town.